The Flite 100 is the one geared wonder in the KHS 'Flite' stable, from the collection of road bikes made by the US based bike company more commonly associated with mountain bikes. The Flite range starts with this steel framed town attacker and builds up to a thoroughbred 15.5lb full carbon race bike. But, just because it is lower on the Flite path does not mean that it is not a high flyer (get your coat - ed). Built using the light yet robust Reynolds 520 steel tubeset the bike adopts the compliant yet springy character that lovers of the ferrous metal yearn for, this tubing is normally used on framesets that cost more than the £499 price for this entire bike! It offers a comfortable ride with not too much flex from the bottom bracket under hard acceleration and doesn't get too bothered when the road surface resembles parts of the Paris - Roubaix which makes it a great city hack or winter trainer navigating frost damaged roads . The geometry is something similar to the Kinesis UK Convert 2, like a relaxed track bike or a responsive road bike, toe over lap wasn't really an issue like on pure track bikes. Indeed there are a lot of similarities between the Convert 2 and the KHS Flite 100 as they both share the same finishing kit; a generic crank (very similar to a Sugino Messenger) which is impressively stiff but not the lightest chainset out there, no frills metal Wellgo pedals and straps, light but not featherweight black wall Kenda Koncept tyres, functional dual pivot black brake callipers, Tektro cross top levers, Weinman SP17 Alloy double wall rims laced up to largish flange unbranded hubs tethered together with 32 black spokes. The main difference are the frame material, fork and the 'bars which combine to produce two very different bikes – despite the similarities in geometry. The Convert uses a lightweight aluminium which is stiff, lively and light and literally skips down the road where as the Flite enjoyed a more subtle ride that took away some of the feedback from the road surface but without muting it entirely. Oh, and there is the extra £100 cost of having the adaptability of a convertible frame with the Convert 2 giving you the ability to run gears and different width hubs. What you get with the Flite 100 is a no fuss single speed road bike that you can convert to being a fixed wheel by flipping the back wheel over the other way if you so choose. I found that the deep track drops put you in a very aggressive stooped forward stance, ideal for attacking off the line and getting some power down in a tuck but left in its single speed guise meant that the cross top brakes weren’t accessible which made the drops a bit redundant for town riding where it is safer to have your brakes covered. Because of the forward curve of the track bars and lack of proper road bike brake lever it doesn’t leave you with many options to put your hands. In fixed gear mode this isn’t so much of an issue but I found the bars very deep for urban jaunts. The 44 x 16T gearing would normally be on the tall side for most places but I found myself spinning out everywhere I went across the flat streets of London with the bike encouraging me to travel at a high cadence. 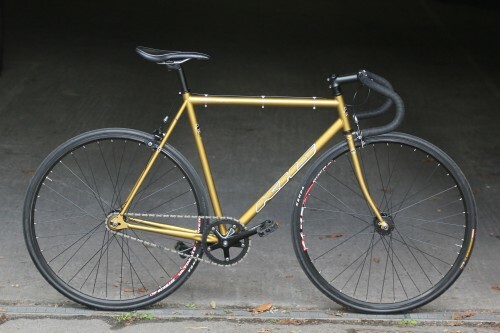 My recommendation would be to swap the track bar and replace it with a normal drop bar and some road brake levers or to run it with a flat bar to open up the attributes that the frame has to offer of comfort and nimbleness, turning it into a fantastic winter trainer or exciting hassle free urban commuter. For £499 you get a great steel framed single speed that is a joy to ride and with a few personal tweeks can be made a superb one. People looking for a no fuss, simple yet engaging ride on a low budget. It is a great frame to upgrade from. Wheels: Weimann SO17 Alloy D/Wall, 32H large flange hubs. Flip flop rear. Wellgo alloy pedals, clips and straps. Remarkable how good the welding is. This isn't going to compare to the stiffness of a modern carbon framed machine but the lively yet forgiving ride urges you to spin the pedals faster. Well chosen generic unbranded parts and a steel chassis should ensure that this iron horse doesn't go out to pasture for quite some time. 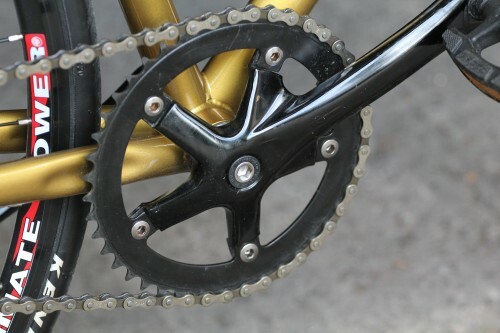 Although at 20lb for the complete bike isn't too bad, you could easily shave another 2-3lbs upgrading some components. This is where the steel comes into its own. It is comfortable for all day riding apart from I didn't get on with the saddle too well and the limited hand positions on the handlebar got a bit wearing. It looks sleek and the gold adds a bit of class. A well thought out compromise of components that should last the rigours of commuting or the punishment of winter. It worked best when being busy on the road, threading through traffic. 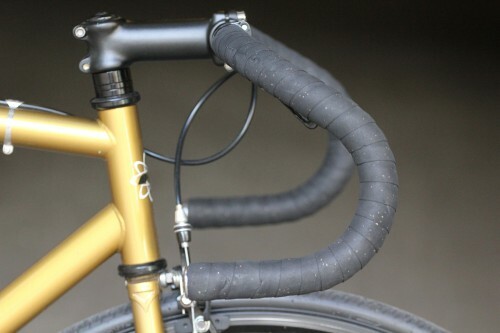 Bolts for a rear rack are provided which is novel on a bike that look like it belongs on the velodrome. The zingy ride that got better the faster you pedalled. Not much room for mudguards. I usually ride: Bike that I am testing at the time My best bike is: Giant CFR pro. Old school carbon converted to fixed. Kinesis Convert 2.